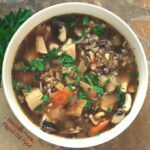 Turkey Wild Rice Soup is a delicious way to use up your leftover turkey meat and stock. Plan ahead and make the rice and turkey stock in advance. Follow either the stovetop method or the crockpot method. Add the oil to a heavy-bottomed Dutch oven over medium heat. When the oil starts to shimmer, add the carrots, onions, and celery. Sauté, stirring occasionally, until the onions are translucent and the vegetables are softened, 5–7 minutes. Add the garlic, mixed herbs, salt, pepper, and bay leaves; sauté an additional minute. Turn heat to high and add the wine. Carefully scrape the bottom of the pot with a wooden spoon to loosen any browned bits. Add the turkey stock, cooked turkey, and rosemary. Bring to a boil and reduce heat to a simmer. Add the cooked rice and mushrooms. Lid the Dutch oven, leaving it cracked slightly open. Simmer for 30 minutes. Check the seasoning and adjust as needed. Serve the soup garnished with freshly ground black pepper, chopped parsley, and grated cheese. Transfer the mixture to the crock of a slow-cooker. Add the turkey stock, cooked turkey, and rosemary. Lid the slow-cooker and set on low for 8 hours. 30 minutes before you plan to eat, add the cooked wild rice mix and mushrooms. Stir to combine and lid the slow-cooker. Raise the heat to high and cook 30 minutes more. This soup turns out best when you use homemade turkey stock, especially my 2-day Crockpot Turkey Stock: your roasted turkey carcass simmers in the crockpot to extract every bit of collagen and flavor.